First, a cure for insomnia….. Following the success/controversy of airing a three-hour extract of a train trip through the Australian outback, SBS has decided to air a 17-hour version of the journey on Sunday. Marketed as Australia’s first foray into the Norwegian genre of slow TV, the program showed – without ad breaks – a driver’s seat view of the famous passenger train on its 3,000km trip from Adelaide to Darwin. Due to its popularity, SBS station Viceland will air the uninterrupted 17 hours from 2.40am on Sunday. The three hour version “got the nation talking, trending nationally on social media, and recorded an average of 583,000 viewers in metro and regional markets throughout the three hour program, making this the highest performing SBS program in the past 12 months,” SBS said to explain the novel programming decision. The vision of outback scenery and train tracks was accompanied by text explaining the local history of each new area – with a focus on Indigenous history and early European, Chinese and Afghan immigrants. Even the 17-hour clip is an edited version. 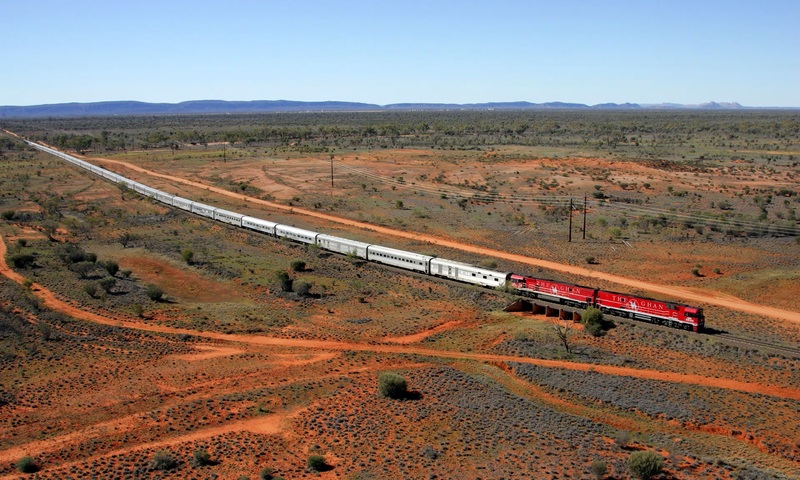 The actual journey of the Ghan goes for 54 hours and is the world’s longest passenger train, stopping at Alice Springs and Katherine over the course of three days before arriving at Darwin. Better (just) than those nature programs with closeups of flies crawling up a wall. Also read about viewer reactions here. I suppose you might get some ideas for layout scenery! Closer to home, I saw this YouTube film of the Bern line and tunnels. High quality viewing, and only an hour long. There are a string of other videos, and look to be worth a look, especially if you model that part of Europe. Scotland has a set of surprise heroes – in the form of road gritters. Thanks to social media, Transport Scotland’s fleet of light-flashing, salt-spraying kings of the road have become a bit of a sensation. Followers have been glued to their screens following the roads authority’s Gritter Tracker. They were surprised to find out the vehicles had humorous names like Sir Andy Flurry, Sir Salter Scott and Gritty Gritty Bang Bang. Whatever next – a collection of manhole covers? My favourite was gritty mcvittie! World’s longest passenger train? The Ghan? How do they work that one out?